Tundrasine is a sight to behold. We almost never write about individual vehicles on the Santander Consumer USA blog, because, as an auto lender, we work with franchise dealerships of all brands. But this is one we just couldn’t resist: a Toyota Tundra stretched into a 26-foot, eight-door limousine. Toyota is calling it the “Tundrasine,” and it’s a sight to behold. 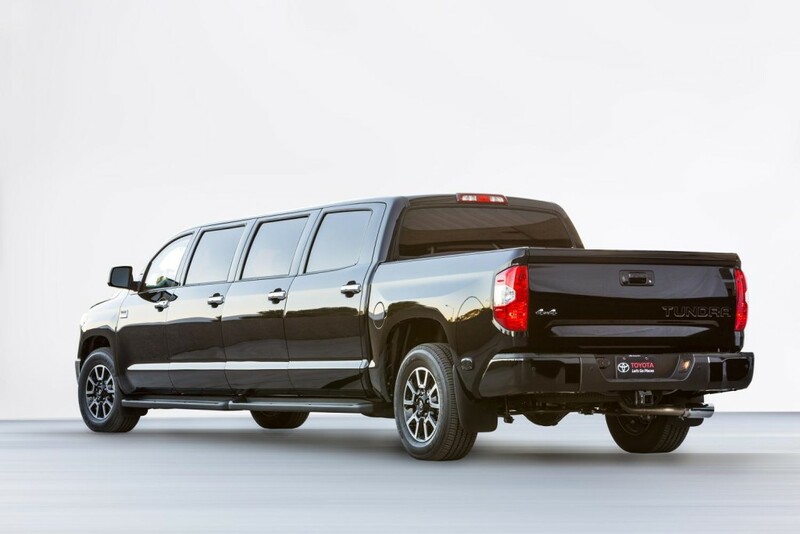 “Toyota definitely goes to a new extreme with the Tundrasine,” said Steve Appelbaum, national engagement marketing manager for Toyota Motor Sales USA, in announcing the vehicle that was unveiled at the 2015 Specialty Equipment Market Association (SEMA) show in Las Vegas. 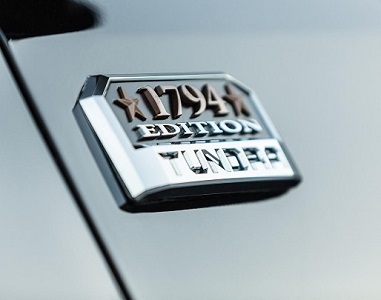 The Toyota “showstopper” – which began as a Tundra 1794 Edition 4×4 CrewMax 5.7-liter V8 pickup – was assembled at the company’s facility in San Antonio, TX, by adding more than 90 inches of sheet metal to the standard Tundra crew cab wheelbase. Not only is the Tundrasine longer, it’s heavier by more than a 2,000 pounds, with a total weight of almost four tons – 7,978 pounds to be exact. Tundrasine interior inspired by luxury private jets. 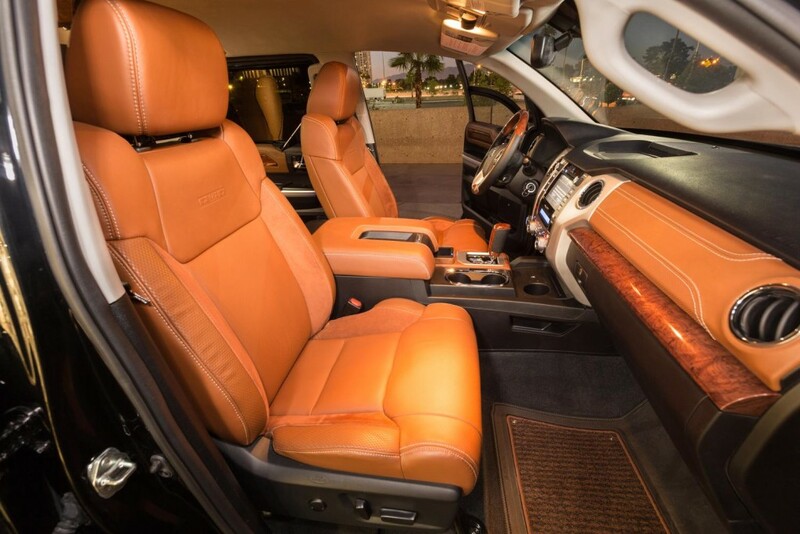 “Inside, the outlandish Tundrasine stands out as the most luxurious truck Toyota has ever built,” suggested Digital Trends’ report on the vehicle. That interior, which was, according to Appelbaum, “inspired by the cockpits and passenger compartments of luxury private jets,” features six captain’s chairs and a rear bench in “custom and functional” brown leather and provides enough seating for nine people. 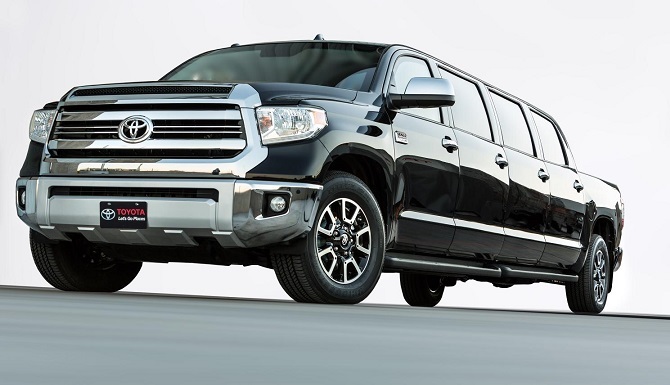 It apparently is anybody’s guess where the Tundrasine goes from the Las Vegas show, and Toyota gave no indication whether any more of the behemoths will be produced. Until Toyota decides, the accompanying photos will have to do for most of us. Tundrasine retains standard pickup truck’s bed.